I know! I know! It has been too long since I have posted and since I have posted pictures. I am here to end that tonight! I have words and pictures! What in the world have I been doing that has been taking up all my time? Well, as I have mentioned before, I have started running...jogging really. I found a super beginner runner schedule online and I have been slowly building up my endurance. Today, I did 5 minutes walking/4 minutes running for 30 minutes. Starting in the next two weeks, I will be decreasing the walking time until all I am doing is running. It is so incredible to see how in just 3 weeks, I have moved from walking 30 minutes to running for 4 minute intervals. Since my friend S believes in goals, I signed up for the Race for the Taste 10K at Walt Disney World in October. I need to keep a 15 minutes mile, and I think with my mix of walking/running, I will be able to do it! I have found running to be a lot like knitting. You start with something simple (garter stitch scarf vs. walking) and slowly increase your skills (mittens vs. running/walking combo) to the point of wicked awesomeness (entrelac socks vs. long distance running). Anyway, the running and exhaustion which comes afterwards (you would be tired too if you were running in Florida in the summer) has taken precedence over my knitting. I know! Blasphemy! I really would like to get into shape though, so I am moving exercise to the top of the daily to do list. Now, I have been doing some knitting. 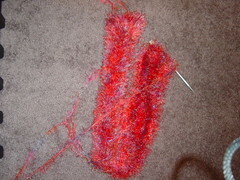 I am continuing to work on my Fun Fur Scarf. I realized as soon as I started that I don't like the sound of aluminum needles rubbing against one another. Since fun fur is a pain to wind and I don't feel like buying additional needles, I am just going to push through the pain. 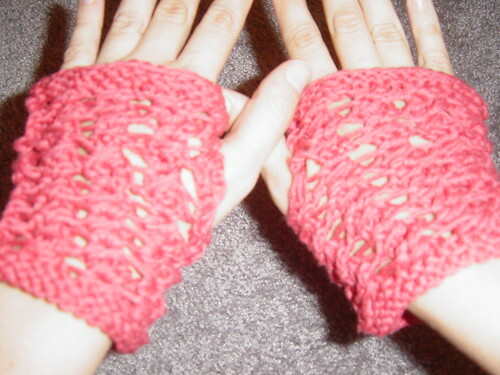 Speaking of procrastination on pushing through the pain, aren't these the cutest fingerless mittens? The pattern is Filigree and is from Knitting New Mittens & Gloves. This is my first pair of mittens and I am quite excited about how they turned out. Yes, there are a few places where I should of purled/knitted or vice versa and the right thumb hole isn't exactly big enough, BUT they are wearable and I wouldn't have them any other way. I can't wait to show them off tomorrow. Finally, isn't this the cutest bag you ever saw?! I got this from the lovely Theresa who was one of the Summer of Lace sponsors. I need to find a cute, small project to put in it. Ack! Where do the days go!? I promise I will get some pictures posted very soon. I made some headway on my fun fur scarf that I need to show off. In the mean time, I want to brag that I got the fall Knitscene and it is as good as all the buzz it has been getting. There are some beautiful patterns in there. I really want to knit Riding to Avalon. It is the most beautiful sweater I have ever seen. I am a big fan of simple details. Ack! Sorry for the long awaited post! The days seemed to zoom by this week. There hasn't been too much knitting going on lately. Instead I have been reviewing the knitting books I purchased in bulk from the KnitPicks summer book sale. I figured I should at least take a look at them, before the books I ordered from Interweave's sale come. I am such a book harlot, it is not even funny. Even when I wasn't knitting during the previous year, I would pull the knitting books out, look at the pictures, and read the patterns. My mom loves to read cook books and apparently the gene got passed on to me in the way of knitting books. Tomorrow I promise to post a picture of the cutest little bag that I got from Theresa. 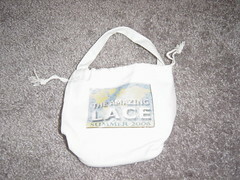 It is an adorable Summer of Lace bag. In other news, I have started running. No the bugs here in Florida haven't gotten that big. I (stupidly?) told a friend that I really want to do the Disney Half-Marathon. Instead of smiling and nodding at my pipe dream. She said "Okay, let's do it." Now that I have other people committed I realized that I need to start to get back into shape. I have started a super beginner training schedule and it has been going well so far. I completed the first week with only one hiccup (I switched my workout and rest days for Thursday and Friday because I was so tired on Thursday night). The only problem with this training schedule is less time for knitting! I am hoping that even though I will now have less knitting time, the knitting time will be more productive, because I will be in better shape. P.S. You must go see WALL-E. It is the cutest movie ever, plus there are highlights from one of my favorite movies, Hello Dolly! There was very little knitting this weekend. Although I was pumped to start a very cute knitted skirt and watch Bleak House (7.5 hours of BBC fun! ), I ended up doing other things. Other things included going to a BBQ, watching season 1 of Lost with a friend, and doing a major overhaul of my apartment. I am turning 27 this September and for some reason I am taking this rather hard. I am officially hitting my late 20s. I know deep down this isn't old, but deep down I feel that it is time to grow up. So you may be wondering what one does to grow up. I decided to clean my apartment in a very serious way. I spent serious time cleaning each room and then throwing things out/donating them, taking stock of what I need to buy (get plastic containers for yarn instead of keeping them in trash bags for the bedroom closet), and doing an extra thorough cleaning job. I am trying to declutter my apartment and make it look like a grownup lives here. Over the past couple of years some bad things happened in my life (i.e. very bad breakup with significant other, very bad breakup with mutual friends of significant other, and spending 2 years with a mentor who didn't mesh with me personality-wise and who I ultimately had to leave). I think I kept trying to cling to childish things, because I wasn't ready to admit that this was my life. I wasn't ready to say that this is my 20s, these are my college memories, and this is how it goes sometimes. Now I have a supportive mentor and friends who will be around when the going gets tough. I don't have a significant other, but the idea of dating doesn't scare me like it used to scare me. With all these positive changes in my life, I am ready to embrace adulthood and to illustrate this change, I am fixing up my apartment. Of course, if you haven't already guessed...one of the great things about doing a thorough "summer cleaning" of my apartment and making it grownup is that with all the freed up space from "childish things" I can store more yarn, knitting books, and knitting accessories! Since having my "minor" freak out about Odessa, I have been working on a simple stockinette fun fur scarf. 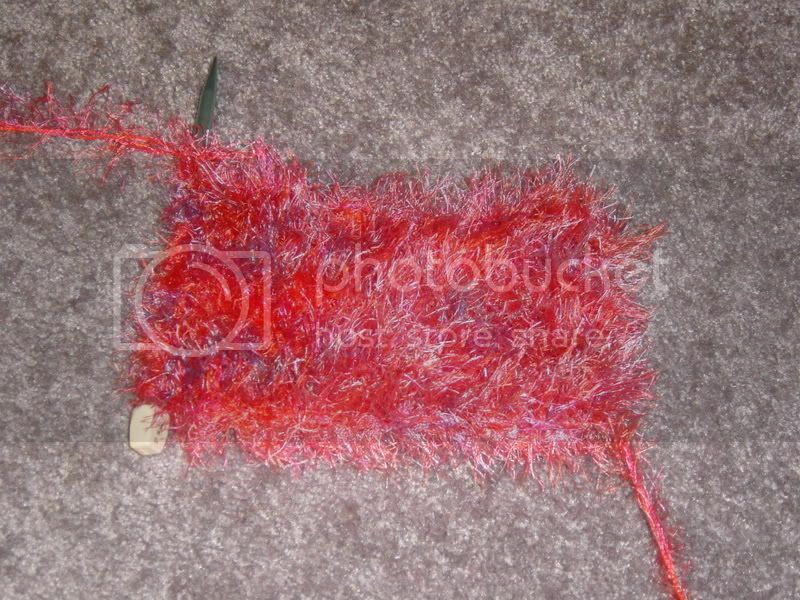 It takes a bit of concentration since I am knitting it with two strands of fun fur and it is easy to not knit both strands each time, but it is far superior to Odessa since I haven't had to tink back once. I am hoping that working on this scarf will make Odessa jealous. I usually keep her around when I am watching TV and working with the fun fur scarf. I think she is seeing the error of her ways and is going to be more amiable this time around. I think she looked a bit forlorn today when I got home. This is normal, right? Most people like to make their projects jealous of each other, right?